We know you. You keep the picture of the Golden Gate Bridge you took in your 20s on your office desk as travel inspiration. You follow all the international photography and travel blogs, and your computer screen is a picture of the Eiffel Tower that reminds you of those two amazing weeks you spent abroad. Maybe you have also saved up your vacation days and are planning your next global adventure…but then again, it’s just so costly. The airfare, the hotels—it really adds up. What if the answer to your wanderlust and financial travel woes was your car? As with anything you own, from the day you purchase or lease your vehicle there is a wide array costs that accompany it. You need to maintain the vehicle, you need to fuel the vehicle, and you need to insure the vehicle. If you’ve been around Drive Electric Northern Colorado before, you’ve heard us talk about the Total Cost of Ownership (TCO) of owning an electric vehicle (EV), and how the TCO of owning an EV is much lower than owning a traditional gasoline powered vehicle. You’ve heard us talk about the fewer moving parts in an EV that require minimal maintenance costs. Maybe you have spoken with an EV owner who has told you that the only fluid they’ve put under the hood in the last two years is a $2 gallon of windshield washer fluid. You’ve heard us talk about the fuel savings. In Northern Colorado we have significantly lower electricity prices than the U.S. average, at $ 0.07 per Kilowatt Hour. 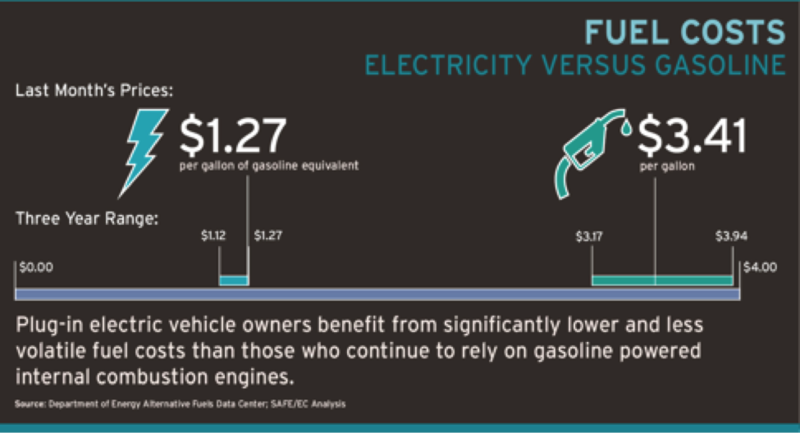 Whereas EV drivers pay approximately $1.27 to drive on the equivalent amount of electricity as a gallon of gasoline, “gas guzzlers” can spend as much as $3.94 per gallon. Curious about how these prices play out? Cover Hound does the math for you. “For example, the Chevy Volt costs an average of $1,452 to insure for one year, while its non-electric counterpart, the Cadillac CTS, costs $2,024. The Nissan LEAF, which was the most popular electric vehicle in 2013, costs on average $1,513 for a year-long policy, compared to $1,801 to insure a Nissan Altima,” said a recent Cover Hound article. Maybe insurance has not been a driving factor in your vehicle search to date, but after knowing that you can save an additional $200- $600 per year, maybe it will! Let’s look at an example case. Alice drives a Nissan Altima about 20,000 miles a year, which equates to about $6,938 in gasoline and maintenance expenses. She visited the DENC Comparison Calculator and typed in information about her driving habits, and compared her current costs to driving a Nissan LEAF, which would spend only $3,996 on fuel and maintenance costs. If we add in the insurance savings Cover Hound reported, Alice would save an additional $288-$560. Combining fuel, maintenance and insurance savings, Alice would save approximately $3,230-3,502 every year. That’s an international plane ticket—and maybe a few nights hotel stay too! Your next globetrotting adventure is within closer reach than you might have thought! Interested in seeing how much you can actually save by driving electric? Check out the DENC Comparison Calculator today!